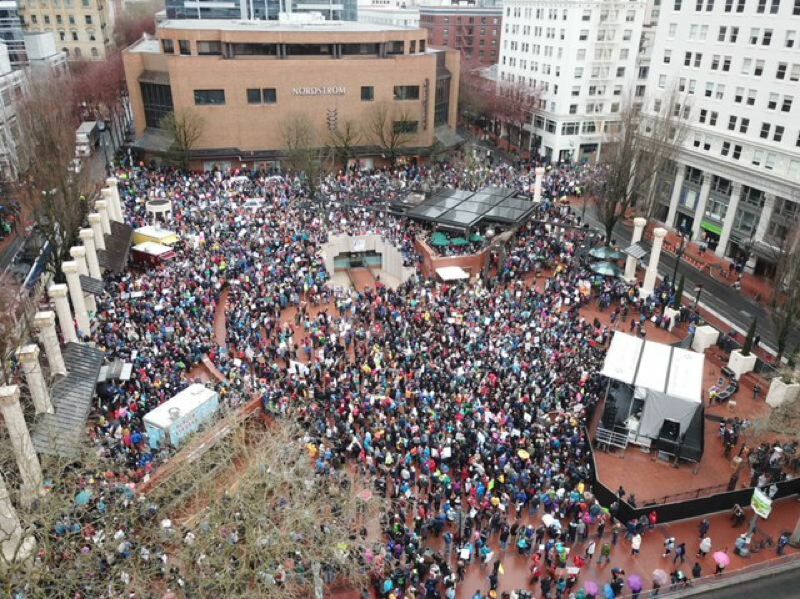 The largest protest since last year's Woman's March drew thousands to Pioneer Courthouse Square. 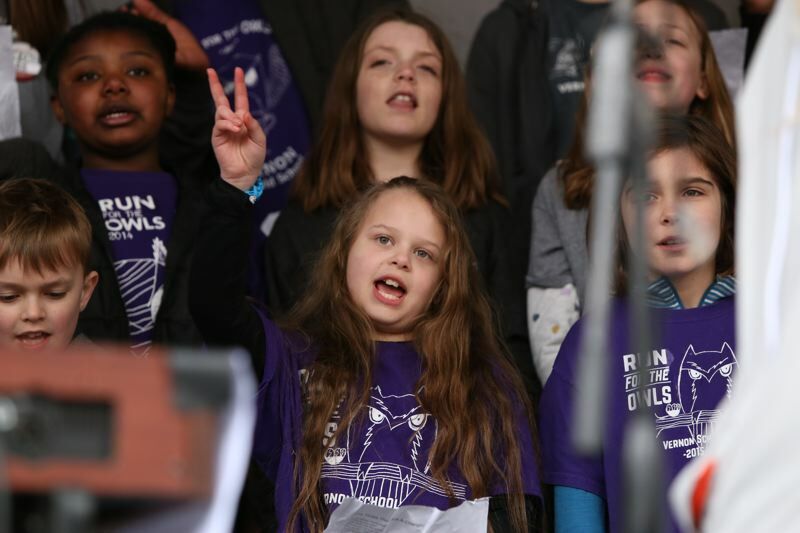 Confronting a nationwide epidemic of school violence and decades of inaction from lawmakers, the Vernon Elementary School choir made a prediction — or maybe a promise. "The times they are a-changin," they sang. Facing the stage in Pioneer Courthouse Square, the crowd of thousands raised their hands in the v-shaped peace sign, their heads bobbing along to the old Bob Dylan tune. "The students here are going to take over the world," said retiree Colin Persichetti of Southwest Portland. "I'm looking to them to get this country out of the hole it's in." 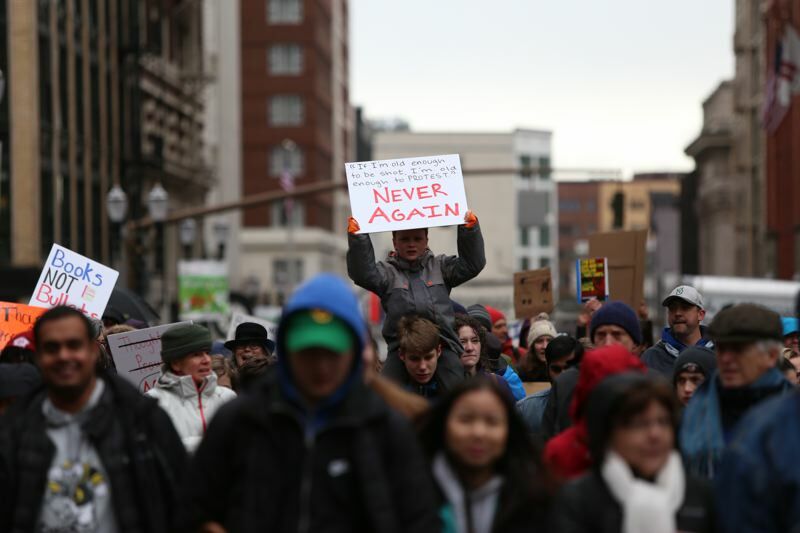 On social media, some 9,000 people indicated their attendance at the student-led "March for Our Lives" on Saturday, March 24 in downtown Portland. Media reports and the Tribune's own aerial photography suggest it was likely the best-attended protest in the area since the Women's March in January, 2017. Students led the charge from a staging point at the North Park Blocks to Pioneer Square. Some seemed somber or angry, though just as many appeared optimistic and inspired by an atmosphere that mixed a rock concert with a political rally. Adults and young activists delivered a common refrain, calling for real changes in the wake of a horrific school shooting that killed 17 students and educators at a Florida high school in February. "Last month was Parkland. This week was Maryland. Tomorrow, it could be us," warned Beaverton student-organizer Calum Nguyen, 18, referring to the massacre at Marjory Stoneman Douglas High School and another recent deadly shooting. 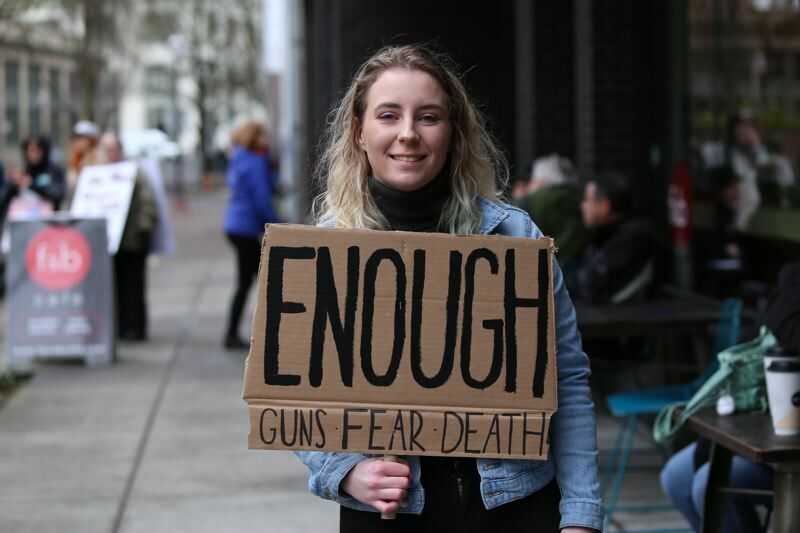 "We will no longer stand for the way our legislators are treating gun control," voiced another organizer, Zoe Dumm of Roosevelt High School in Portland. After an hour of speeches, the punctuated Portland musical act Portugal. The Man took the stage, performing their hit singles "So American" and "Feel It Still" as a culmination to the protest. "This is really in your face," lead singer John Gormley said from backstage as the crowd chanted "Vote Them Out" and "Never Again." The pop musician argued that the day's events shouldn't been seen as a Democratic or Republican issue. "The idea that politics should be involved in any of this, kids feeling safe — it's ridiculous," he commented. "Let's come together in some common ground. Everybody wants kids to feel safe in school, right?" added bassist Zach Carothers. "Let's start there, and start spreading it out." Earlier that day, undeterred by an accurate forecast calling for cold and wet, the multitude churned through the mud to reach the march's rallying point at the North Park Blocks by 10:30 a.m. Marchers and a handful of counter-protesters tossed out taunts at each other as the mob formed. "They want to stop the NRA," counter-protester Jacob Natzel told the Tribune. "Hitler wanted gun control. Look what happened! Six million Jews died." The senior at Heritage High School in Vancouver was joined by a friend with a bullhorn. While volunteer organizers called for participants to ignore the counter-protesters, one older man approached Natzel to poke fun of his busted horn rims. "You can't even take care of a pair of glasses," the man cried. Before things could escalate, the Unpresidented Brass Band tromped over, the sound of their horns and trumpets drowning out the angry shouts coming from both sides. Others in the crowd struck a different tune. "I'm tired of being seen as weak, and I'm tired of seeing gun violence in schools," 18-year-old Tova Broadbent said from the sidewalk next to the staging area at 235 N.W. Park Avenue. The senior at Century High School in Hillsboro said she hoped the day's event become a showcase for unity. "Our deaths are political, but it's not about left or right," she continued. "It's about finding a solution." 1:27 p.m. The protest and concert have concluded, a bit earlier than expected. Check back soon for a complete recap. 11:28 p.m. Portugal. The Man is preparing to take the stage at Pioneer Square Courthouse as part of the "March for Our Lives." When asked, he said musicians have always gotten in politics, but gun violence in schools shouldn't be seen through the lens of Democrat or Republican. "The idea that politics should be involved in any of this, kids feeling safe — it's ridiculous," he said. U.S. Rep. Suzanne Bonamici, a Beaverton Democrat representing Oregon's 1st Congressional District, said she joined the protest to listen to students who are saying "enough is enough." "I hope that more of my colleagues understand people deserve to be safe in schools and in the community," the congresswoman said. "I'm very proud of the students." 10:14 a.m. A small group of protesters and counter-protesters tossed out taunts at each other as the crowd gathers in anticipation for the "March for Our Lives." "They want to stop the NRA," counter-protester Jacob Natzel told the Tribune. "Hitler wanted gun control. Look what happened! Six million Jews died." The senior at Heritage High School in Vancouver was joined by a friend with a bullhorn. While volunteer organizers called for participants to ignore the counter-protesters, one older man approached Natzel to poke fun of his busted horn rims. "You can't even take care of a pair of glasses," the man cried. Natzel told the Tribune he's had the spectacles for six years. The "Unpresidented" marching band then tromped over to Natzel and his friend and began to play loudly, largely drowning them out. 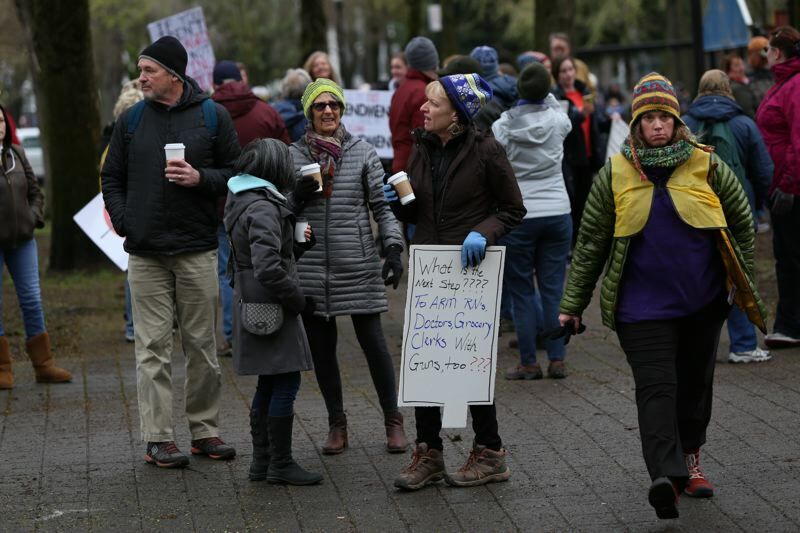 Others who gathered at the North Park Blocks in downtown Portland struck a different tone. "I have to worry about getting shot in school, as opposed to worrying about tests," noted Mya Ganzer, 16. "My message is that young people and adults will no longer stand for a lack of action." The Beaverton resident said she's tired of hearing about politicians "thoughts and prayers." 9:36 a.m. Hundreds have already gathered at the North Park Blocks ahead of the student-led "March for Our Lives" anti-school shooting protest. The march to Pioneer Square Courthouse is expected to begin at 10 a.m. in downtown Portland on Saturday, March 24. "I'm tired of being seen as weak, and I'm tired of seeing gun violence in schools," 18-year-old Tova Broadbent said from the sidewalk next to the staging area at 235 N.W. Park Ave. The senior at Century High School in Hillsboro joined last year's Women's March and also serves on her local Youth Advisory Council. She said she hopes the day's event become a showcase for unity. Portland band Portugal. The Man will perform later today after the march and a round of speeches from young activists. The Tribune is live at the scene, gathering information from the marchers. Check back frequently for more updates. One of the biggest names in the local music scene will perform during a student-led protest against gun violence in schools on Saturday, March 24 in downtown Portland. 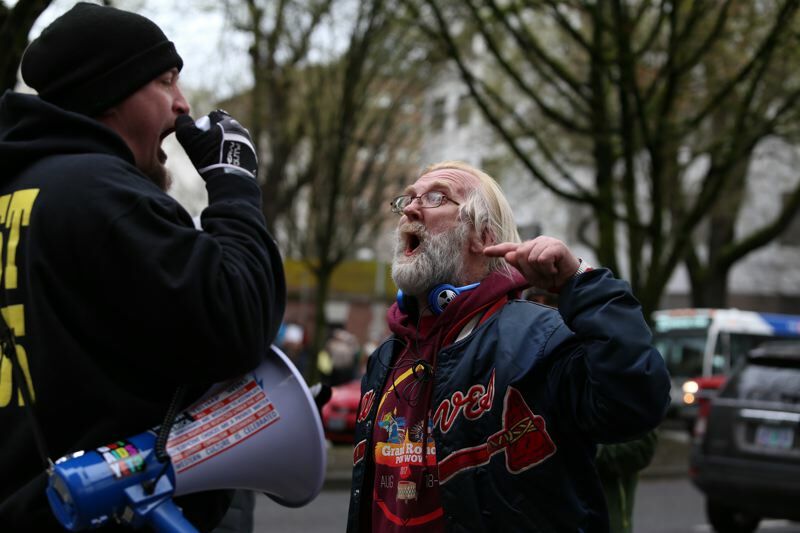 Protesters will gather at the North Park Blocks, 235 N.W. Park Avenue, starting at 10 a.m. for the "March for Our Lives," according to event organizers. At 10:30 a.m., the crowd is expected to march toward Pioneer Square Courthouse, where school-aged activists will deliver speeches and musical act Portugal. The Man will perform. The event should wind down by about 2 p.m., according to a Facebook page set up for the event. Portugal. The Man — a six-piece sensation that has relocated to Portland from Alaska — took home a Grammy earlier this year for "Feel It Still," a hit single off their latest album, "Woodstock." 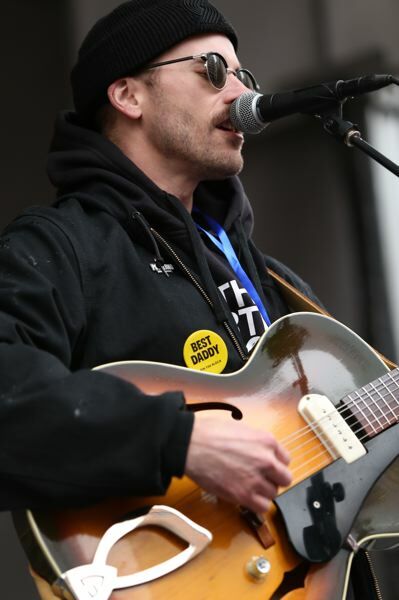 "It is truly inspiring to see what the students in Portland and across our nation are pulling together, to be part of this march and lend support is an honor and something we feel very strongly about," said lead singer John Gourley in a news release. "No kid should ever be scared to go to school," he continued. 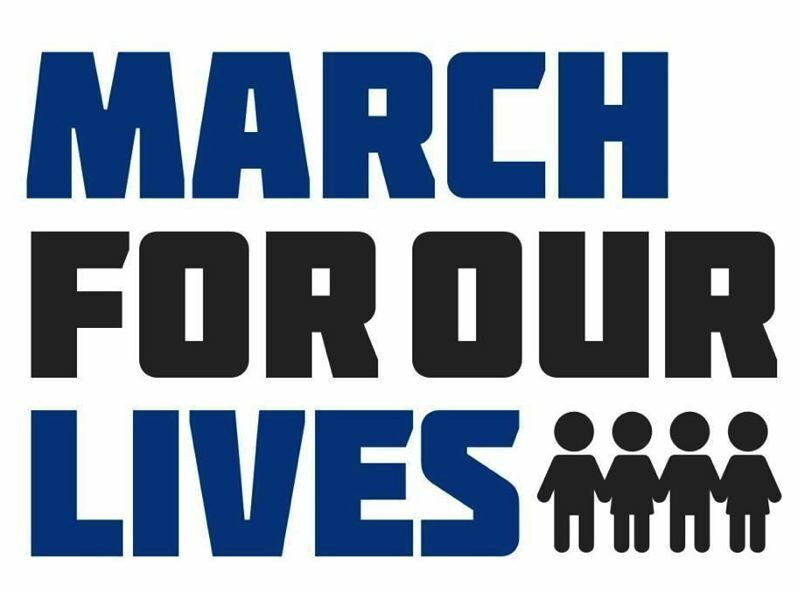 The "March for Our Lives" is one of about 500 protests set to occur across the nation on Saturday. 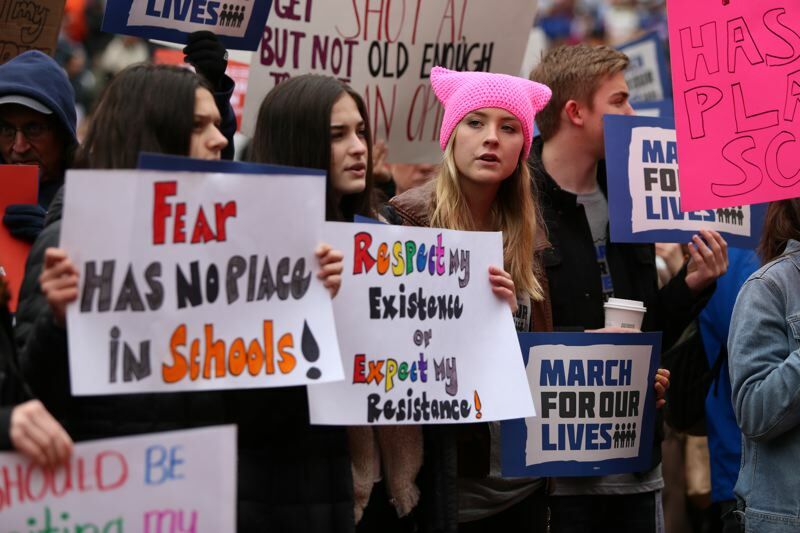 Students in high schools and universities say they were galvanized to act after the horrific slaying of 17 students and educators at Marjory Stoneman Douglas High School in Florida in February. 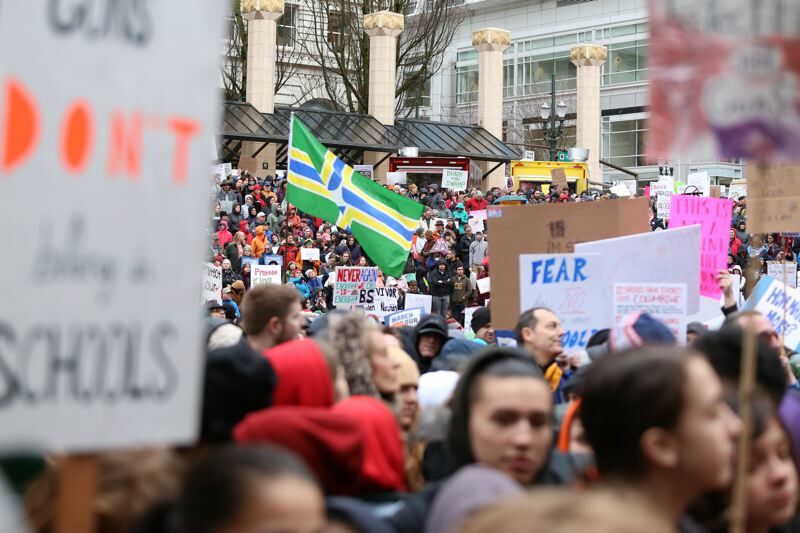 "Our elected leaders don't have the political courage to do what needs to be done," noted Alyssa Diaz, an organizer attending Portland State University. "My parents and grandparents did not sacrifice their lives to move to a country where their kids have to worry about being shot while getting an education," added Kien Truong, a student at Portland Community College.